Yesterday, I wrote about Eli Pariser’s intriguing new book, which argues that social media like Facebook and search engines like Google are creating filter bubbles. In turn, he maintains these filter bubbles result in increased political polarization among Americans. Pariser has argued that Google uses 57 signals to personalize someone’s search results. Today, I tried a brief experiment to test Pariser’s theory. I asked my liberal mother-in-law in Massachusetts to Google the word, “war.” I did the same. At first glance, both searches seem nearly identical. There certainly does not appear to be any political bias. After all, the White Aryan Resistance showed up in the fourth spot for both our search results. This website is hardly one a liberal would embrace, and certainly not one I would either. However, upon closer inspection, the ordering of our top three results differs. 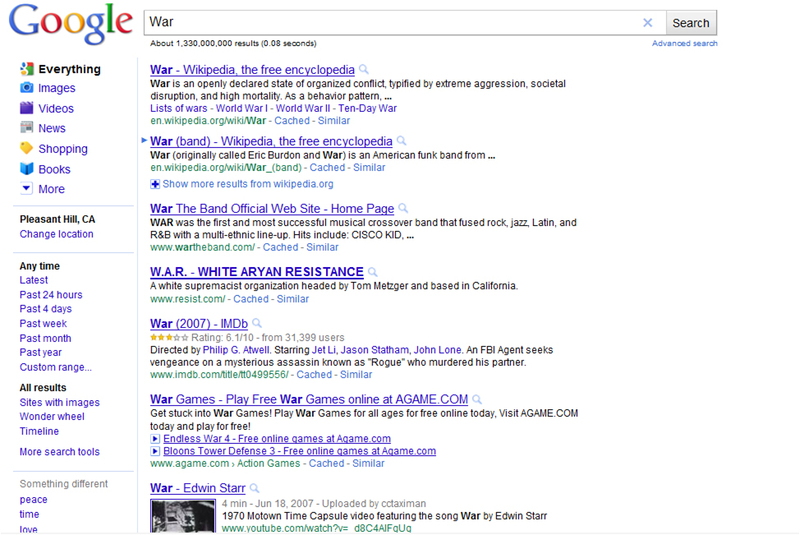 My first result is the standard Wikipedia entry on War. My mother-in-law’s is for the band War. Why is this the case? 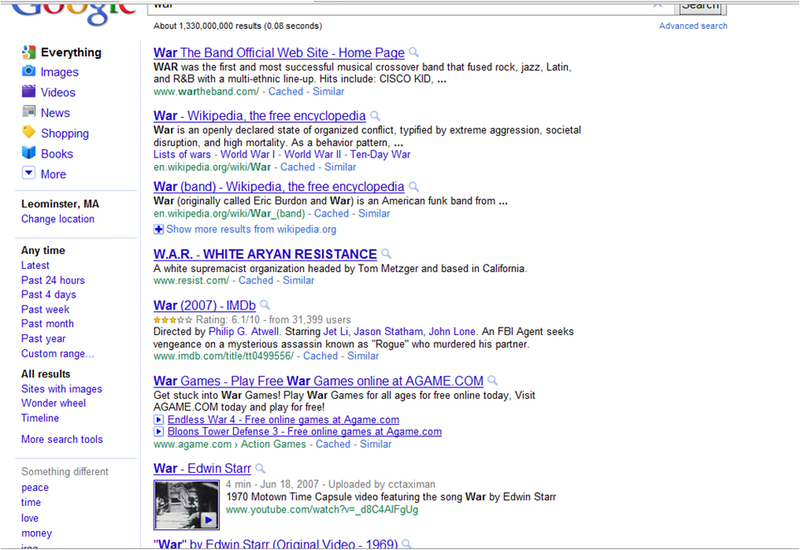 Well, the band War was formed in 1969 and is popular with the baby boomer generation. I never heard of them until I did this little experiment. The bottom line is that there are minor differences between my search experience, and my mother-in-law’s. However, the difference was presumably based more on age than on political affiliation. However, I believe that my results would have reflected more differences if I were living in Texas instead of the very liberal San Francisco Bay Area. If you try the same experiment and get different results, please email a screenshot to shazlett (at) mba2006 (dot) hbs (dot) edu and I will include it in a second post with more samples. This entry was posted in Business, Media, Politics, War and tagged Eli Pariser, Experiment, Google, War. Bookmark the permalink. I dunno, do they know that much about us, and is that how they order their searches? Genuine questions here, I don’t really know. I just did the same search, have near-identical results to you, just emailed it to you. (Also, War is an important band! You might recognize their first hit, with Eric Burdon of the Animals, “Spill the Wine”). Got your email. Thanks. I am hoping more folks send me their results so I can post them. My mother-in-law and I ran a number of searches from “Sarah Palin” to “fairness” and pretty much got identical results. I ran one on Newt Gingrich and got the same results as you. I think geography must be a strong variable in the algorithm as every sample I’ve seen thus far comes from strongly Democratic leaning states. I’m hoping Pino (North Carolina) or Vern (Canada) send me samples some time this weekend so I have a larger sample size. I’ve got the same as your mother-in-law, so it better not be age-targetting. Um, yeah, somehow didn’t realize you’d put the video at the top. Today, I am waking up slowly. 57 as the 57 states of America?? It must a plot. I sent you my test. I’m going to see if I can get my niece to do this. She lives in Idaho. That’s the reddest of red states, and she’s under 25. That should diversify your results. I’ll be sure to include it in the results, which I will publish some time in the middle of this week. I suggested the same to my sister in Idaho also. She’s (about) my age. Moe in FL would be a good test too. Pino from Tarheel Red in NC and reflectionephemeral from Poison Your Mind in DC have also sent submissions.